SF5922S is a high performance, cost efficiency，highly integrated DCM（Discontinuous Conduction Mode）Primary Side Regulation （PSR）controller for Offline LED lighting applications. The IC can meet tell certification in cell phone charger application. SF5922S uses Multi Mode Control to improve efficiency and reliability and to decrease audio noise energy @ light loadings. Around the full load, the system operates in PWM+PFM mode, which improve the system reliability. Under light load conditions, the IC operates in PFM mode to achieve excellent regulation and high efficiency, and to achieve less than 70mW standby power. 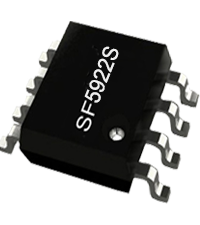 SF5922S also integrates the function of " Max Frequency Clamping @ Output Short Circuit" to limits power MOSFET Vds spike when output short circuits occurs. SF5922S has built-in proprietary NC-Cap/PSRTM control for CV control, which eliminates external compensation or filtering capacitor, It also has built-in cable drop compensation function, which can provide excellent CV performance. SF5922S integrates functions and protections of Under voltage lockout (UVLO), VDD Over Voltage Protection (Output OVP), cycle-by-cycle current Limiting (OCP), pin Floating protection, VDD Clamping. SF5922S is available in SOP8 packages.